Small and midsize businesses do not really require expensive software to track the records of their customers. A small investment on any CRM (Customer Relationship Management) Software can successfully track and protect all your customer data. You can read detailed Review of Top Two (2) Best CRM Service Provider for Small Business and Companies below. Insightly CRM Software is simple, yet advanced feature software that would take care of all small and midsized businesses. It comes with basic capabilities that would fulfill all the requirements of micro businesses. This high scalable software will help your business grow faster. Moreover, it is one of the most reasonable CRM solutions available. Lastly, its offers a free trial pack and other affordable paid plans for a start. Why to Choose Insightly CRM? The software features with the Insightly gadget to automatically save any Gmail mails to your CRM. It will also link it to your contacts and other projects. You can access these mails through the Insightly system easily and quickly. This will help you to automatically sync Insightly contacts with Google contacts. In addition, it will also sync Insightly Tasks, Events, and Milestones with your Google Calendar. You can easily access google drive while using Insightly. The other added advantage is you can attach Google drive files into your Insightly tasks. Zoho CRM Software is most advanced and most powerful software which comes with the capabilities which every small and midsize business would expect in any full feature CRM software. To try it out, you can invite up to 10 users with no extra cost. The best part of this software is you can access it at any time of the day and at anywhere by using Zoho CRM's mobile app even without buying any plan. 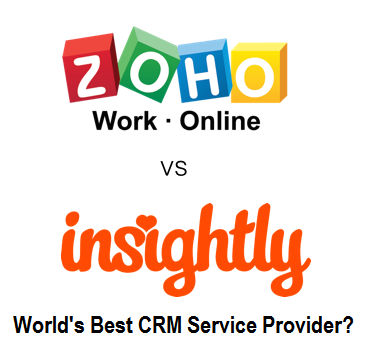 Why to Choose Zoho CRM? Opting for Zoho CRM would be highly beneficial for your midsize business. The moment you finish using the free version, you can go for the paid plan. The starting rate of the paid plan is just $12 a user per month. It provides you with all the features as the free version, and along with this, it also offers other features like customizable reports, sales forecasting, mass email capabilities, marketing campaigns and many more. Furthermore, the process of upgrading from free to paid version is easy. You only have to login and follow the instructions given. Other than these, Salesforce, Nutshell, NetSuite, Act!, Infusionsoft, SugarCRM, TeamWox, Highrise and Microsoft Dynamics are the shortlisted ones. At present, customer service and effective CRM Strategy is the most important aspect of any business, but more importantly, it is customer retention and loyalty. It is the responsibility of the company to strengthen and maintain a good relationship with the customer. Click here to know more about Best CRM Software.